“Anime Auteurs” is a new series in which we discuss the works of unique but rather obscure anime directors. 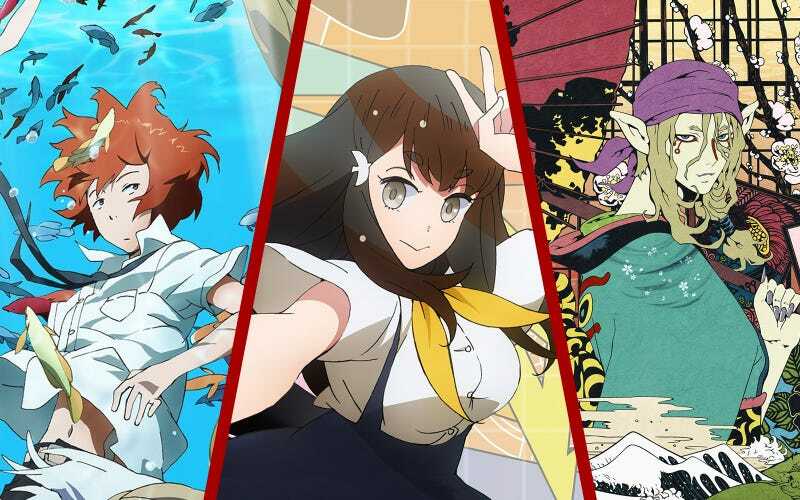 In this article, I’d like to introduce you to the incredibly versatile works of Kenji Nakamura through his anime Tsuritama, the two Gatchaman Crowds seasons and Mononoke. Gatchaman Crowds insight was my favourite anime of 2015. It’s a super sentai show with a sincere message. It’s thought-provoking without shoving its values down your throat, yet it never hides its sentai roots and features plenty of gorgeous fight sequences. I could go on about how great insight and its predecessor are (like what a great and complex main character Hajime is) but I’m going to shift the focus onto their director: Kenji Nakamura. 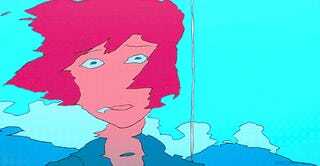 Nakamura directed one of my favourite anime, a sadly under-seen gem called Tsuritama. The story of a group of friends who fish together in order to defeat an alien threatening to destroy the world (yeah, you didn’t expect this sentence to go on like this, now did you?) resonated with me on such a deep level thanks to its great exploration of themes such as friendship and trust, as well as the show’s general cheerfulness, use of colour and great soundtrack. After seeing that anime, I was hooked on Nakamura’s directing and quickly watched the occult detective anime Mononoke (no relation to the Studio Ghibli film) and after that Gatchaman Crowds, as well as its 2015 sequel insight, among Nakamura’s other works. These three are not the only anime Nakamura has directed, but they are the ones I have enjoyed the most - and more importantly for this article, those which show his abilities best. What immediately leaps to one’s eye when watching Nakamura’s anime are their lush visuals. From Mononoke’s ukiyo-e style and Klimt-referencing visuals to the bright and colourful shared? * worlds of Tsuritama and Gatchaman, Nakamura’s anime are always a joy to behold. However, his anime are not just senseless eye candies; the visuals always carry depth and meaning, as well as being an integral part of the anime’s plots and settings. Giving Mononoke ukiyo-e visuals makes it inseperable from its setting, Edo period Japan. The visuals make clear that Mononoke’s plot belongs to the Edo period and could not possibly take place in any other time or place. The addition of Gustav Klimt-inspired imagery on the other hand, gives it a dream-like and sometimes even psycho-nightmarish quality, as the Klimt-like imagery often appears during the more fantastical and metaphorical scenes, such as when the unnamed main character performs an exorcism. These scenes are always tinged with gold, the primary colour Klimt used in his paintings. 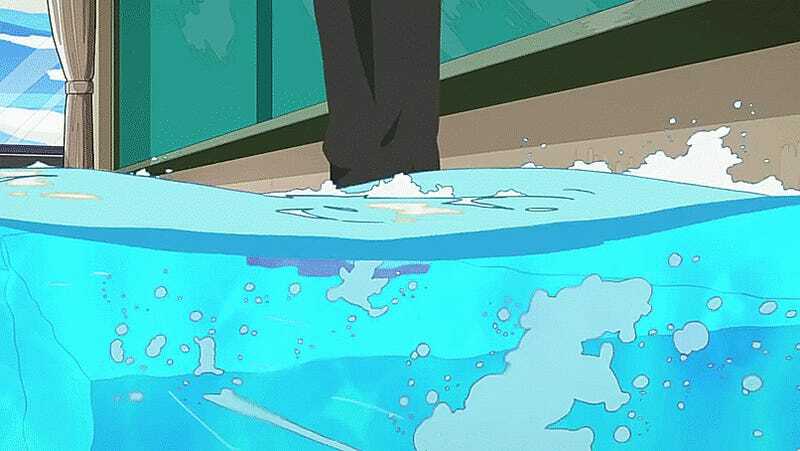 Unlike Mononoke’s lush yet dark colours, Tsuritama and Crowds’s colour palattes are bright and convey a cheerfulness generally befitting both anime. Tsuritama mostly uses tones of blue, highlighting its setting, the small island Enoshima in the summer. Its visuals give off a feel-good-vibe that is sure to not only leave a huge smile on your face, but also make you want to leave for Enoshima and cast the fishing rod into the sea as soon as you’ve finished the anime. What a great and complex character Gatchaman Crowds’ Hajime is has been the subject for many essays and blog posts. Though at first she comes off as your typical ditzy-but-cute moe female lead, it soon becomes apparent that she’s much smarter and more thoughtful than she seems. She acts selflessly but cautiously, often approaching presumed villains instead of mindlessly attacking in order to get to know them and solve predicaments amicably. Should the need to fight arise though, she’ll do everything in her powers to not just save the innocent but even the villain as well. However, I have to admit that Hajime is very much a character the viewers either love or hate. For all her complexity, she still acts like quite a ditz and it’s up to everyone individually to decide whether they are able to stomach her many eccentricities. Unlike the other two examples listed above, Yuki does neither revel in his lonerism, nor is it being glorified. The way Yuki developes as a character over the course of Tsuritama’s 12 episodes is both believable and relateable. Nakamura is certainly not the only one who is to be credited for the well-written characters in his anime. Toshiya Oono, who worked on both Crowds and Tsuritama as head writer, deserves just as much credit for instance. By teaming up with good writers (as well as other talented staff members), Nakamura makes sure that his anime deliver complex characters and worlds. Nakamura’s work is thought-provoking in many different ways, addressing personal as well as societal matters. Gatchaman Crowds and insight deal with those of the social kind. Through the social network GALAX, Crowds explores the benefits and downsides of social media. While it gives its user the chance to help others in need easily, it also allows Rui, its creator, to surveil what is going on on the internet. While Rui uses this power for what he believes is the greater good, many are understandably less than thrilled with the prospect of being put under surveillance 24/7. One of Gatchaman Crowds’s biggest achievements is making this over-used Orwellian trope appear fresh by simply giving it to one of the heroes of the anime instead of the villain, thereby asking, how can something like GALAX be used for good? Can it, in fact, be used for good at all? Nakamura doesn’t give the viewers a definitive answer but demands that we think about it ourselves. Gatchaman is progrssive without ever being pretentious. It doesn’t tell you that something should be accepted, but shows you without needing to spell it out. Thus, its cast includes the aforementioned Rui, an androgynous boy who openly cross-dresses, and a powerful yet kind-hearted humanoid, O.D, whose gender and gender identification are left ambiguous. While other directors would make the question regarding O.D’s gender or campy behaviour and Rui’s cross-dressing sources of innuendo and jokes, neither Nakamura nor any of the characters in the Gatchaman series ever mention them. They are who they are and they are accepted for who they are. From gender to social and political identity, Gatchaman addresses a variety of social issues. If you’re interestend in an in-depth look at Gatchaman’s social commentary, I recommend reading this article by MementoMorie. Similarly, this acceptance of others who do not fit “the norm” is also found in Tsuritama. Here, we have Akira, a 20-something Indian and his best friend, Tapioca the duck (¯\_(ツ)_/¯) who are welcomed whole-heartedly into the group around Yuki which also includes a couple of aliens. The friends bond over their shared love for fishing. While Akira is sometimes the subject of jokes due to his age as compared to the high-school-aged rest of the cast, he’s still an important part of the group and a close friend of and to the others. While the Gatchaman series thematise social issues, Mononoke touches upon more personal issues like guilt and Sehnsucht. Every arc of Mononoke deals with different dark desires and suppressed feelings, using mononoke - evil spirits of Japanese folklore - as metaphors for the inner darkness one avoids facing or keeps hidden. While not all of those desires are relatable, Nakamura’s brilliant visual language gives the viewers insight into the mindset of the characters haunted by the mononoke so as to make us emphasise with said characters - which brings me to my next point. One thing Nakamura excels at is how he visualises the complex. Be it political systems and elections or people’s thoughts, feelings and anxieties, Nakamura has a way of making them appear simple yet profound. Whether it’s a woman looking up at the blue sky through a barred window longing to be free or a young man imagining he’s drowning due to his social anxiety, Nakamura’s use of visual metaphors often resonate with the viewer in deep and meaningful ways. As mentioned above, Yuki’s social quirks aren’t played for laughs or portrayed to make it seem cool but treated seriously as a major problem that causes Yuki suffering. The visual metaphor perfectly captures this and is repeatedly used which makes it all the more sweet when he breaks out of the water. Unconventional, beautiful, weird as well as deeply insightful and modern. All of these words fit the works of Kenji Nakamura. I personally am very excited to see what he’s going to make next. All credit for the gorgeous header goes to Maelwys. The Gespenst finds it immensely difficult to describe himself so he’ll be talking about his love for manga and anime instead. A fan of anime and manga since he first laid eyes on Sailor Moon, he mostly writes Anime Series Blogs and the occasional review. While suspense and mystery are his genre of choice, he’s always on the lookout for the next soothing Slice-of-Life anime. He can be found on Twitter@TheGespenst where he regularly talks about his favourite manga and anime in over-excited, yet eloquent(?) ways.